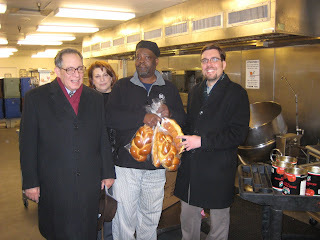 Yesterday, I had the privilege of accompanying program committee members Donna Bassin and Frank Spigel to DC Central Kitchen to donate challah. Last May we sold and distributed challah in our Penn Quarter neighborhood during Jewish American Heritage Month. We offered the option to purchase challah to donate to DC Central Kitchen. Nineteen people took that option, so yesterday Frank, Donna, and I dropped off 19 loaves. Kitchen Director Jerald Thomas was on hand to accept our donation. Thanks to Donna for coordinating the challah pickup from Bethesda and drop-off at the DC Central Kitchen. We'll have challah available again in May this year, $5 for a single loaf or $20 for the month. If you want to donate challah this year, email us at info@jhsgw.org! When I was about nine or ten, I went to cheder at 6th and G. We lived in southeast Washington, within the shadow of the dome of the Capitol. I was never afraid to walk home after dark, through the Capitol grounds, singing “Adon Olam” or “Ayn Kalohanu” at the top of my voice. We love this quotation. 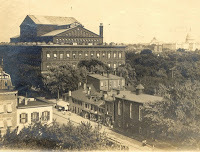 It sums up being a child who worshipped—and went to school—in the original Adas Israel synagogue (seen in the lower right corner of the photo). We love it so much that we're going to use it in an exhibit we’re planning for the synagogue. 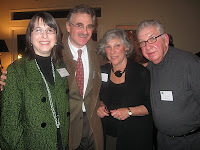 We wanted to find out more about Rose Hornstein. That’s where some detective work came in. Thanks to an obituary of Rose’s brother, we were able to find her nieces. They’re searching for photos for us right now. Most importantly, Rose’s two nieces told us about their lives growing up in Washington—one even shared a synagogue newsletter she had written. So when you think that no one is interested in your family’s story, think again! Thanks to the Hornstein family, we’ve been able to learn more about going to school in our building. The new year is also the Society's 50th anniversary year! You can learn about our history on the About page of our website. To celebrate this special year, we're proud to announce a year of monthly gatherings throughout the community. Check our Programs page for updates!